Emerald. This is more of a topcoat than a wear-alone glitter because it's so sheer. It's a fine opalescent emerald colored glitter in a clear base. I have on about five coats and you can see it's still quite sheer. 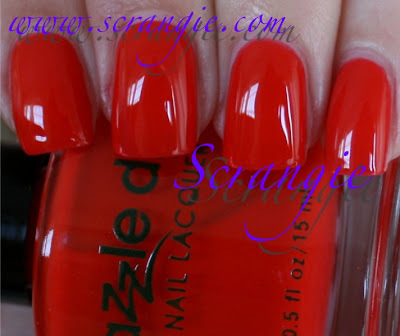 With Dazzle Dry you can actually do five or more coats if you wanted and it will still dry faster than normal polish and it won't bubble. It's a gorgeous color but an odd choice for a layering polish in this collection- it doesn't seem to go with any of the other colors! Red Hot Chili. Holy moly, that's bright. Awesome. As you can see it's a painfully bright light red with orange tones- this actually looks pretty coral-colored on my skin tone but more red in the bottle. Savory Cranberry. A rusty type of soft red shimmer. It's not orange enough for me to truly call it rust and it certainly doesn't look cranberry colored to me, so I'm not sure how to classify this shade. All I know is that I want Thanksgiving dinner right now. Serious Cinnamon. Easily the most interesting shade in the collection. Also my favorite of the bunch. It's a really rich brass shade made up of tiny little sparkly particles. You would think it would be a foil based on how it looks in the bottle but it's not! It's more comparable to those Milani metal shades (like Melt In The Sun) but I find the finer-textured particles in this to give a prettier finish. Absolutely perfect for fall. Before I go on to talk about the texture/formula, I must address one thing. These are not 'normal' polishes- they are a special quick-dry formula and must be used with the Dazzle Dry system for them to work as intended. I'm sure you could use your regular basecoat and topcoat with these and the color will look just fine, but you won't get the lightning-fast dry time and steel-like chip resistance. The formula on these is quite unusual, but I suppose it's normal for Dazzle Dry. In a cold room they're almost jelly-like but still apply pretty smoothly. Once they warm up they're the texture of regular polish. They seem like they'll be too thin but they're very pigmented so you don't need many coats. I did three of all except Emerald which is five. They only needed two but I wanted to see how they would look with three. Dry time is unbelievably fast, even with the five coats of Emerald. There's a set of treatments that you use in conjunction with the Dazzle Dry polishes. There's a nail prep, a basecoat and a topcoat. You apply the nail prep to cleanse the nail, apply the basecoat and let it dry completely (about a minute), apply as many coats of your Dazzle Dry polish as you want and then apply the Dazzle Dry topcoat. It will dry completely within five minutes, give or take. And I do mean completely- not just set or dry on the top- completely dry from top to bottom. See my previous post for more information. Overall, tiny collection but still not bad. I like the gold. I like the Emerald glitter but it doesn't seem to belong in the collection. It doesn't look right layered over the rest of the colors, but it does look fine alone if you don't mind a sheer glitter. What I like most about these is their drying ability. You can rush and be sloppy and glob it on super thick and it will still dry flat and smooth in no time at all. Cinnamon is fantastic on you! Unfortunately the last few times I've tried to visit their website (from different computers, even) I was unable to see any pictures, only color descriptions. I notified them with the Contact Us link, so I hope that gets fixed. I'd like to try some of of their colors but right now your pictures are the only ones I've seen - and they have lots more colors! Chalk me up for that Serious Cinnamon! That's HOTNESS! Interesting system. Serious Cinnamon looks awesome...I wouldn't call it cinnamon though. It looks more like a tarnished gold. That green glitter is gorgeous. With the 5 coats, it looks kind of dimensional, since you can see glitter at different depths in the polish. As long as you have clean, unstained nails, Emerald works fine by itself. 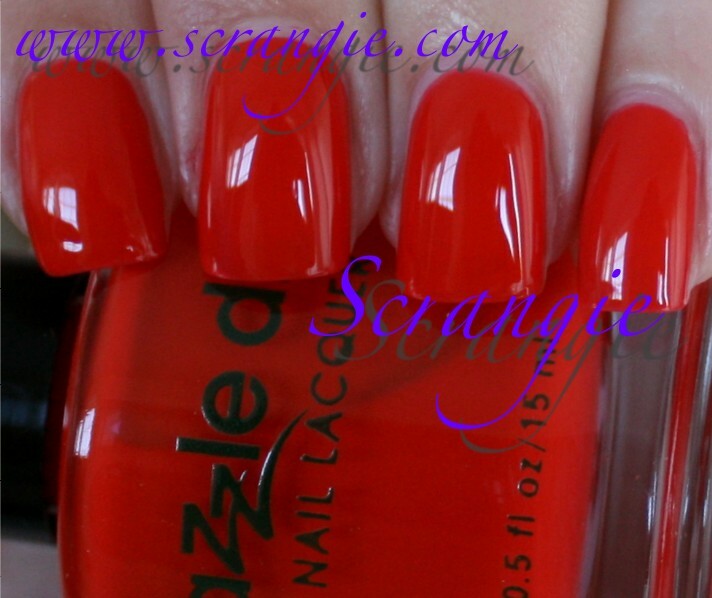 Can you even use another polish brand as a base color along with the Dazzle Dry system? Scrangie, please post Essie Winter collection swatches! Seriously, are you planning to? Love the Serious Cinnamon on ur nails, looks so good! I agree with Aimee. Do you know what's wrong with their website and whether that's still a legitimate way to order? Pretty! I haven't tried these yet, but some of the colours look awesome. Emerald would look wicked over gold or white for Christmas. I've never used this system. Serious Cinnamon is really gorgeous. I hope I can find another brand that's a dupe for this.